Yala National Park has one of the highest densities of leopards anywhere in the world. The leopard is also the top predator on the island..Yala National Park was initially started as a Game Sanctuary by the British in 1894 and was established as the Yala National Park in 1938. Yala covers more than 100,000 hectares of wildlife with Kirinda to west, Kataragama to North, Panama to east and the indian ocean to the south. Yala is divided in to 5 areas known as block 1 to 5. The most visited area is block one.Some parts of the park were closed for visitors due to LTTE Terrorist activities in the past but now most of these area are open to the public. 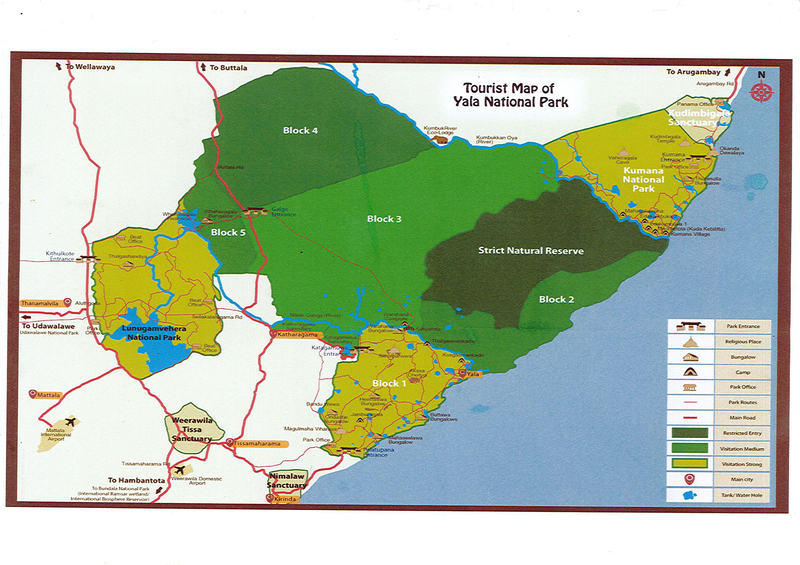 Weheragala (Yala Block V) of Yala National Park can be described as a beautiful wilderness with hardly any visitors. An ideal safari area for those who prefer a private nature experience but it has to be stressed that wildlife sightings tend to be much less here than in block 1. You can sight leopards in Yala at any time of the year.Yala Block 1 has one of the highest densities of leopards per square kilometer in the world and the leopards are quite used to vehicles. In Weheragala ( block V) leopards aren’t as used to visitors as they are in Blcok I, sightings are slightly less. That said, when a leopard is sighted, visitors can usually observe them in complete privacy. We have been doing safari for many years winning the hearts of the visitors arranging different types of safari according to our experience that best suits for yala visitors. You will stay inside/outside the park and you will continue safaris extra time rather than the normal safari tours to the parks during your stay at campsites and bungalows inside the parks. We organise safaris to the nearest Bundala national park, Yala national park, Lunugamwehera national park and Udawalawe national park too. If you wish to experience and unforgettable safari tour with a driver who can speak good Engilsh and has got a sound knowledge about the jungle and its flora & founa with his luxurius jeep to provide you a comfortable and friendly service join Yala Gihan.